This is probably one of my favourite consoles. Most consoles you want to have out as early as possible because they give , , on runs, virus tokens or even card draw. This means you would run 2x or even 3x a console which can be installed only once. 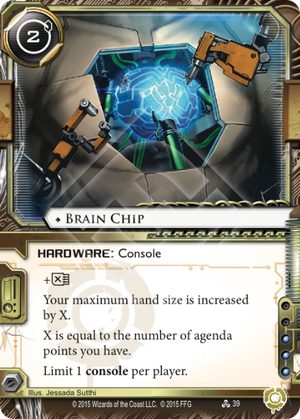 The fact that Brain Chip is essentially a late game console makes it such a nice one of in all those decks that don't rely on an early console with the above features, thus saving deck slots and possibly some influence.